I was very happy with the performance of the truck, and it felt more-less “complete”. There were minor things to finish off, but to move onto the next step would mean re-doing the truck entirely from one end to another. It would be like destroying a creation – my creation – something that I was very proud of that that I just couldn’t do. I wanted something new, too. Over a decade of looking at the same dash is a long time. It was time to look at something else in the driveway, learn about a new chassis, try new ideas, and generally start fresh. I couldn’t financially afford to keep the Comanche and build another new 4×4. After some months of advertising the beast on this (www.bc4x4.com) website, someone came along and took ‘er away. I hope “Ol’ Black & Tan” will give him the same good service I got. I’ve decided to keep these pages up (relatively unchanged, originally hosted on www.bc4x4.com), though. Judging on the email I’ve received over the years, it’s served as a good reference point for lots of other people. That’s good, that’s what the information is here for. I’ll continue to answer questions about the truck, but remember, as the weeks grow into months and now a decade, since I’ve sold it, memory on details will also begin to fade. for about 4 years, at which time I moved to the coast. The Rugged Trail kit had sagged to about 2 inches lift. Tomken had not yet come out with their tall lift kit, and I was unaware of how to lift it higher. Unable to afford another kit, I made my own front coil blocks, and had a local spring shop rebuild the rear leaf pack to match. At a full 4 inches lift, I ran 31’s and I was happy for the next couple years. Over this period of time, I was quite happy with the truck’s performance. (Actually, I’ve always been happy with its performance, just always wanting more!) I had trail rode with Larry Soo for a while now, and I was itching for some more changes. I hooked up with the core of what is now the Island Rock Crawlers, who proceeded to introduce me to trails which were pushing the Comanche’s ability. Well, the rest, as they say, is history. What follows is a detailed account of what I consider the most interesting modifications to the truck. But first off, I must thank some individuals for their help, insight, abilities, and encouragement. 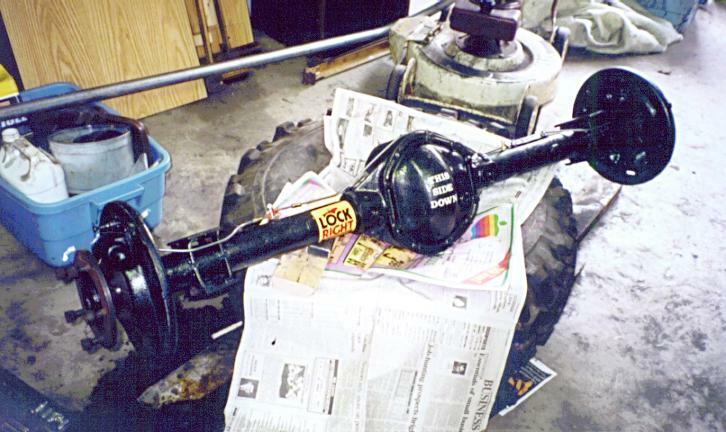 I didn’t have many problems with the original rear Dana 35 axle, except for its appetite for Lockrights! I was running 33’s and many people told me “the Dana 35 won’t survive” although other than for Lockrights, it did. My (bad?) habit of overbuilding things insisted that I upgrade, though. 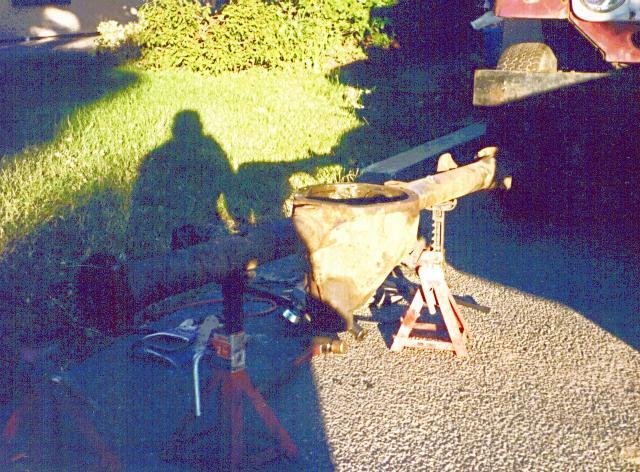 A Dana 44 from a Scout was selected. 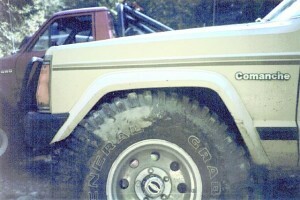 Jeep runs an odd backspacing, so with standard offset rims on the Scout axle, the track width remained the same. It didn’t take long to decide that a complete rebuild was in order! The stock gears were 3.54 and I was running 4.10’s. The axle had also been neglected by the original owner. Everything was replaced – all the seals, bearings, differential guts, and brake parts. The only parts I re-used were the shafts, the housing, and the brake drums. I wanted to build it for disc brakes, but it was beyond my budget. A few months later, it was ready for install. The axle received a Lockright. Powertrax was kind enough to replace my last blown Dana 35 Lockright with a Dana 44 Lockright! Plans are to eventually replace the Lockright with a Detroit Softlocker, but this isn’t high on the priority list. Luckily, the Scout uses the same size driveshaft U-joints as my Jeep! That saved the time and expense of tracking down different yokes. 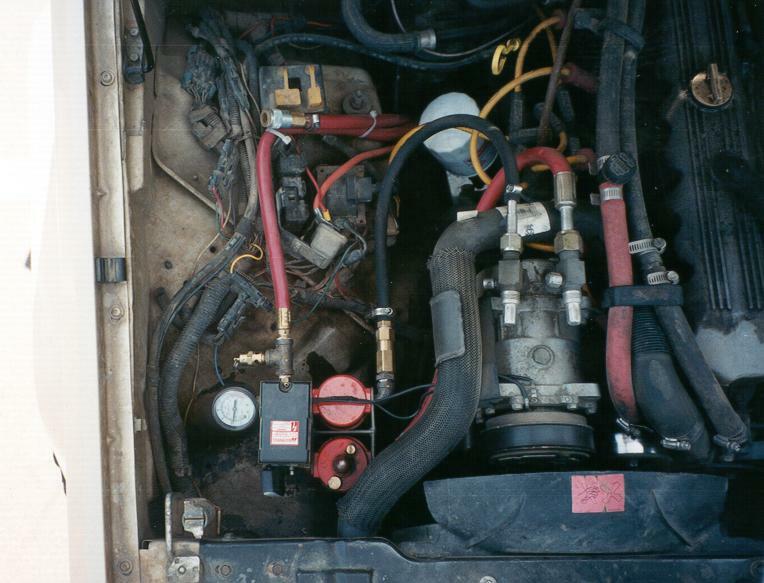 I used the stock Comanche emergency brake lines as well – they were compatible with the Scout drum brakes. Install was very straight forward. It bolted in much the same as the stock axle. No gotcha’s! The axle has worked flawlessly since it was installed. I have since had to replace one rear axle shaft, because the splines were becoming twisted. I discovered this when I installed the rear disc brakes (tech article to come). 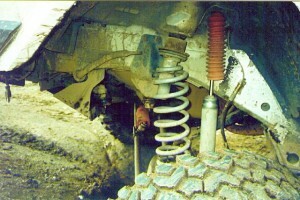 The rear suspension has gone through many incarnations. It has started from stock plus an add-a-leaf, to being rebuilt to give me ~4 inches of lift, to becoming sprung-over. I’ve added and since removed the blocks. Currently, I have a custom leaf pack which was built for 4 inches lift, with a sprung-over configuration and no blocks. The shocks have been remounted into a configuration that matches Toyota pickups. I am using 13.5″ travel Black Diamond XT shocks. I have also installed a 3/4-‘liptical rear suspension design and longer rear shackles to obtain more lift (in place of blocks). This combination yields me about 9 inches rear suspension lift over stock. 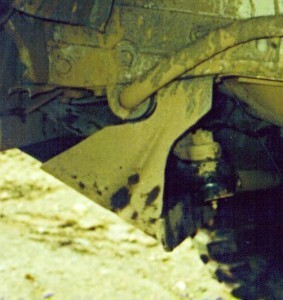 The emergency brake cables have been replaced with ones intended for a ’86 Comanche, because the older Comanche brakes lines were about 4 inches longer. I’m sure some people don’t believe how tall my truck actually is. There seems to be only a few people who are crazy enough to lift these trucks this tall! Well, for confirmation, I decided to park my truck next to my friend’s XJ. 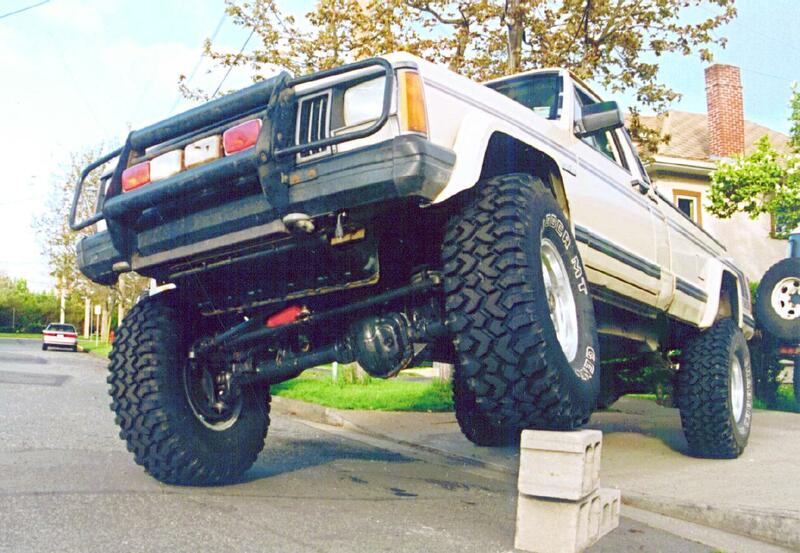 This XJ has 31″ AT’s and runs 3″ of lift here. Judge for yourself. Remember, the truck now sits about 1-1.5 inches tall than when this picture was taken, too! The front axle is definitely the most involved project I have ever performed on this truck! It is also the one that I’m most proud of. 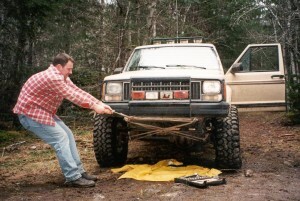 The front axle started life under a Scout. Since the Scout front axle has a right hand diff, this meant either swiching to a different transfer case (like a Dana 300) or moving the pumpkin from the passenger’s to the driver’s side. I chose the latter because measurements show the engine/transmission/transfer case combo is offset slightly to the passenger side. Rather than making new engine mounts, etc., etc, I thought it would be easier to just move the diff to the passenger side. And at the same time, I could reset the pinion angle and caster. It was done by a local shop, in such a way that I could re-use the stock Scout axle shafts. I prefer the Jeep 4-link system to the Ford 2-link set-up, and conversion would have been very hard, since that would have meant removing the Ford axle welts to make room for the Jeep control arm mounts. 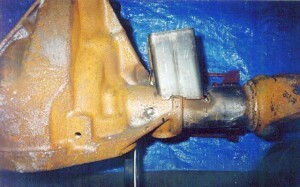 The Ford Dana 44 diff housing is centered a bit more than the Scout one. I was worried about oil pan clearances. With the Scout axle in place, I’m glad I went with the Scout! It was a Ford part! By the way, the old Ford Bronco axle width is just about right. Rough measurements show it to be within an inch or so of the Scout axle width. As with the back axle, the front axle is also assembled with 4.09 gears, and all new seals, bearings, and gear set. Wayne Foster assembled both the front and rear axles. The carrier is a Detroit soft-locker. Yes, it’s an automatic locker. But now that I have driven a vehicle with a front locker, I wouldn’t dream of putting any other type of differential carrier up there! It’s great, amazing, super! I love it! Control arm mounts on the axle were custom made, and were moved up to give more clearance at the control arms, so I would both hit fewer things, and to improve the control arm angles. I also incorporated additional lift into the coil spring spacers. 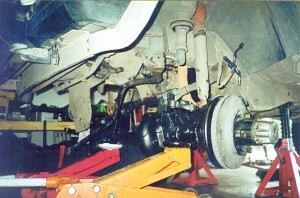 This first picture shows the new lower control arm tacked in place on the driver’s side. Notice how it’s not square with the axle tube, to match the angle found on the stock axle. The second picture shows how much the differential housing was rotated from the knuckle yokes, to both improve front driveshaft angles (to cancel out vibrations), and to get the yoke up, out of harm’s way. You can also kind of see the inner sleeve installed by the shop when they moved the housing from the passenger side to the driver’s side. The last picture shows the passenger side of the axle, with both the lower control arm mount and the shock/coil spring perch in place. I was surprised how much the shock/coil spring perch dwarfed the axle – that’s what happens when you build 2.5″ lift into it, I guess! The shock holes and the coil spring pad still have to be welded into place. 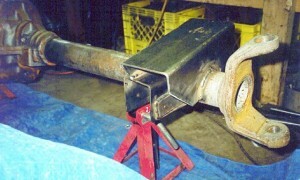 One upper control arm mount had to be welded to the housing. This is very specialized welding that most welders can’t perform. John Edgar performed the surgery at Larry Soo’s shop. John Barron used a MIG welder for all the other welding. Yours truly designed the brackets – no brackets were re-used from the stock axle, since the truck remained no the road while this axle was built. All new brackets ranged from 3/16″ to 5/16″ stock, depending on the purpose of the bracket. A trick: when you are building a front axle, it doesn’t hurt to paint the insides of the axle tubes. To do this, use a spoungy paint roller on an extensions – it works slick! The axle installed easily, and the holes lined up better than the stock axle! 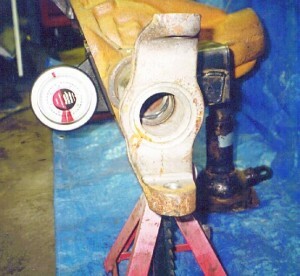 The picture shows Vern O’Connor lining up the bolt holes for the upper control arms. The track bar and brake lines are temporarily swung out of the way, the shocks not yet hooked up. The following 3 pictures show details of various front axle components. Note, however, that these pictures are big! I debated making them smaller, but felt it’s be worth it in terms of detail to leave them high resolution. 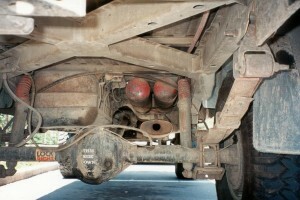 The first picture is a good general shot of the complete axle, working and under the truck. 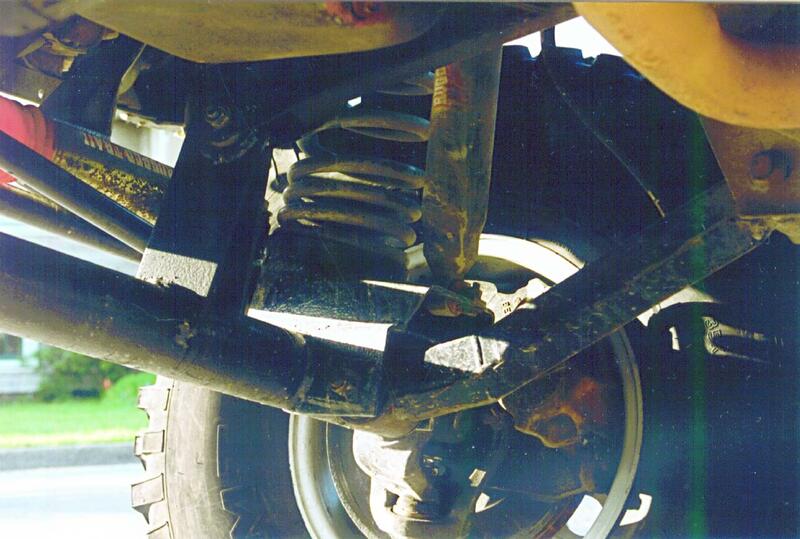 You can see the steering in relationship to the axle tube – tucked way up high and out of harm’s way (or so I thought!) There’s fresh rust on the skid plate because I notched it to clear the steering. The rust was painted shortly after the picture was taken. You can also clearly see the extra plating I put on the front diff. cover. The amount of trimming I had to do is also pretty evident. The front part of the fender is pulled forward a couple of inches. In the second picture you get up close and personal with a lot of the parts. You can see a bit of the upper control arm mount. The track bar hole has also been moved up to match the steering relocation, to avoid bump steer. You can also see the drag link come done and attach to the passenger tie rod end. The steering configuration is much like the YJ steering, but I used GM 3/4-ton steering components, so strength shouldn’t be an issue. I also had to modify the steering stabilizer mounts to a much more conventional method. Again, it’s tucked way up high so it’s out of harm’s way. The third picture shows the extra diff cover plating up close, as well as the rest of the steering. The little hole at the bottom of the coil tower is to aid in cleaning the parts with a pressure washer. Yes, that’s antifreeze on the diff cover! The lower radiator hose was replaced shortly after these pictures were taken. The fourth picture shows my custom control arms and the upper and lower control arm mounts. The shock is mounted in a manner very similar to the stock set-up. You can see the track bar and the tie rod, but not the drag link in this picture. This axle has proven to be a very successful project. No problems have really turned up, other than its appetite for wheel bearings. I attribute that mostly to a lack of maintenance on my part. If I re-pack the wheel bearings about every 4 months, then I don’t seem to have problems. Some people say I should consider changing to an internal hub design, but the Scout axle is unique with than 8-bolt spindle pattern which would make such a conversion rather difficult, and, for me, not worth the effort. The front suspension has also gone through many incarnations. Presently, I run 1 inch spacers on the top of Rubicon Express ZJ 4.5 inch lift coils, and 2.5″ of lift built into the axle, to give a total of about 8.5 to 9 inches of lift. 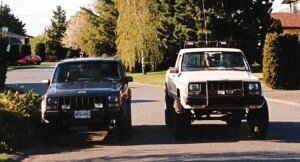 XJ coils are not tall enough, since MJs (Comanches) are heavier than the XJs. I am using 12 inch travel Black Diamond XT shocks. The control arm mounts are moved up about 2 inches on the axle tube. They are also moved back, so that the control arms would continue to clear the axle tube. This had the side-effect of moving the axle forward under the truck, which I wanted to do anyway, to clear 35 inch tires. I’m now running 36″ tires without problems. The added side-effect on steering (needing to relocate the steering box to use the appropriate pitman arm) is discussed below. The control arms are very similar to Tomken’s but instead of using poly bushings, I use stock rubber bushings. The result is an extremely quiet ride and lots of flex without any load put on axle or frame components. I do, however, get a bit more front axle wrap than I did with the stock axle. I feel that this is a combination of relocating the control arm mounts on the axle, and of the soft rubber bushings. If you are building a front Dana 44 for your Cherokee or Comanche, do not relocate the arm mounts on the axle any more than I have. I spent a lot of time drawing pictures of how the arms would look at different points in the suspension travel, and this is as far as I think you can go. And I wouldn’t move the mounts this far if I wasn’t running so much lift. The shock is still helping the vehicle. If the tire is off the ground and the vehicle shifts, you are entire at the mercy of gravity and any other forces there. If the tire is still on the ground, then at least your shock may help dampen the forces, hopefully giving you that moment to react. I’ve watched the tire when the spring is completely unloaded, and the applied engine torque seems to “pull” the tire into the ground. There may be no weight from the vehicle, but there is definitely more than the weight of the tire and axle forcing the tire down, when you apply torque. Even just the traction applied from the weight of the tire and the axle is infinitely greater than no traction. At full compression, the coil is asked to do strange things, as is shown in the picture! 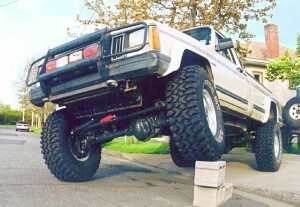 This, though, will happen on any XJ or MJ set up for lots of articulation. Note, however, how this suspension has been designed that as the suspension reaches full compression (it’s not there yet in this picture! ), that the tire ends up relatively centered in the wheel-well. This means that at normal ride height, the tire is actually set back in the wheel-well a bit. A side effect is that the coil may rub against the frame rail, making a terrible noise. Unfortunately, I don’t think that there is any real cure. With ~8.5″ front lift, the steering and track bar took a lot of thinking! As the above pictures and descriptions show, I went to Chevy steering, and remounted the steering and track bar to avoid bump steer, etc. Without playing with the coil spring perch, I’m not sure how you’d be able to move the track bar mount up higher on the stock, though. If you ran a shorter track bar, you could. But you want as long a track bar as possible. Or at least keep the track bar length and the drag link length as close as possible. I wanted to flip the steering parts as well, and use as many over-the-counter parts as I could to make replacing parts easier in the future. Second priority was to keep the “family” of parts all the same. In the end, I used strictly Chevy parts (cheaper and very heavy duty), but had to make my own tie rod and drag link (from Chevy parts, just it meant I had to weld up steering parts, which I’m not keen on, but it seems to have worked, and it’s definitely lots stronger than the stock tie rod parts.) I also had to reverse the taper on one tie rod end – where the steering stabilizer would normally mount. You have to keep the drag link (off the pitman arm to the right knuckle) parallel to the track bar, or you will create additional bump steer, because of the different arcs these parts would travel in as the suspension cycles. Also, keep them as close to the same length as possible. It’s paid off on mine. Despite all my mod’s the truck still tracks very well, rides smooth, and has minimal (but a bit) of bump steer. Less than I had with my stock axle and 5.5″ lift and 33’s. You will create a tiny bit of play in the steering, which cannot be avoided. The problem comes from how the new drag link attaches to the steering at the knuckle. Since there is an angle on the drag link, it can “turn” the tie rod ends and tie rod just a wee bit. But this is so minimal you honestly don’t notice it. It’s less than the wander you get from large tires with tall sidewalls, and less than the play in your steering box. 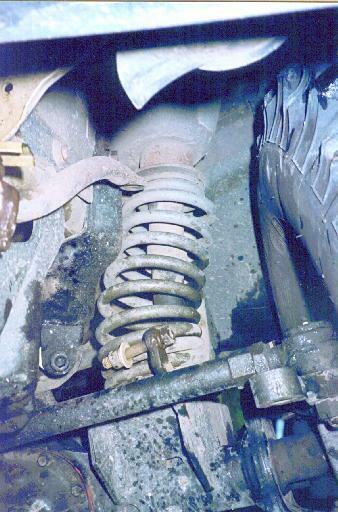 You have to make sure that the inverted steering will clear your sway bar connects and the coil spring perches which are welded to the axle. Since I moved the sway bar connects up with the coil spring perches and everything else, mine is alright. But if you move the steering on your stock axle, you will have to do something with these sway bar links – either rebend them and extend them, replace them with something completely different, or just cut them off and run with no swaybar at all. I’m not sure about things like coil spring perches, best to check. 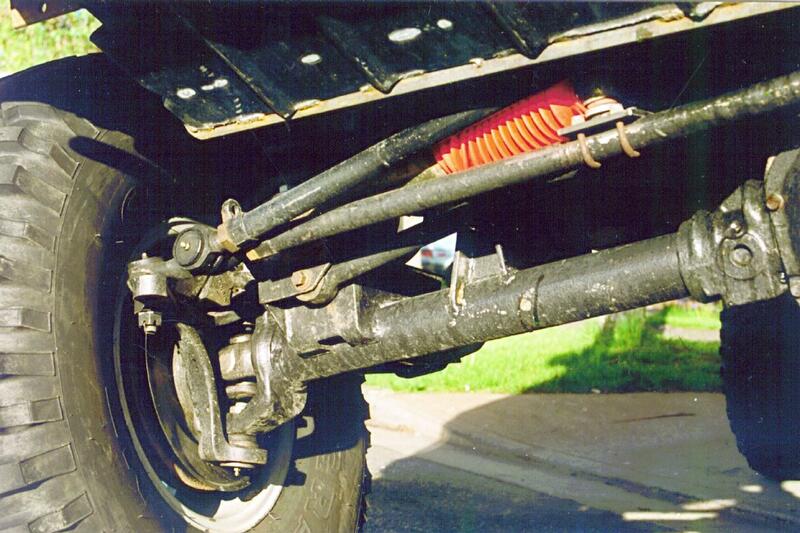 Consider your steering stabilizer, ’cause right now it attaches to your drag link. When I changed mine around, I had complete control, so it now attaches to the tie rod about mid-way between the knuckles, and right above the track bar axle mount. The clearance between the track bar and the steering stabilizer is “tight” but everything clears, even throughout suspension and steering travel. The decision to flip the steering on top of the knuckles was mandatory for me. The decision to drop the inverted Y was arbitrary, but a good one in my opinion. The effects on the vehicle’s toe-in increases as the inverted Y angles change. And since I ‘wheel a lot I figured I might as well drop the inverted Y to keep my toe in the same regardless of what I’m asking the suspension to do. If you look closely at the above picture, you’ll notice that I’ve already managed to put a slight bend in the tie rod, near the right tie rod end. *laugh* It’s a good thing I flipped them on top of the knuckles – it would have bent up the stock steering like a pretzel for sure! I dropped the front end onto a stump from a few inches. It likely affected my toe in by about a half a millimeter – not enough to worry about! Also, Dana 44 knuckles are longer than the stock D30 ones. This means that since I’m still running the stock pitman arm, my steering doesn’t turn as sharp as it should. I’ve looked at getting a longer pitman arm, but that means relocating the steering box on the frame, which really isn’t an option. I can’t use shorter knuckles or the steering will interfere with the coil and track bar mounts. So right now I’m stuck with a poor turning radius. The flip side to this, is I have less chance of breaking a front U-joint due to extreme angles. It is also possible to break these parts. Well, I haven’t broken the Chevy steering parts yet, but have the track bar a few times. I used to always blow out the factory tie rod end on the track bars, so (as the picture shows), so I replaced the end with a 3/4-inch heim joint. 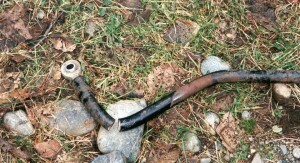 Since that, I have broken the track bar once (shown, that’s now my spare), and 5 heim joints. 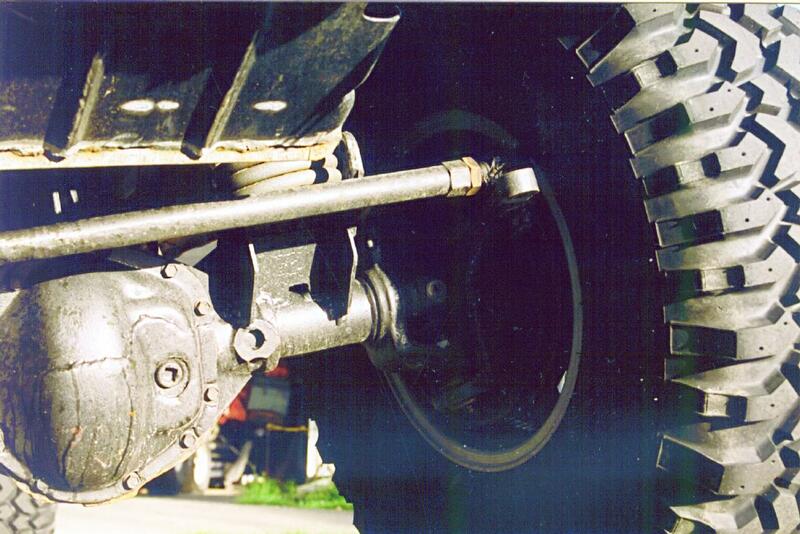 I’ve broken most of the heim joints within the past year – since I’ve gone to the 36″ Swampers. Too much weight and traction, I guess. The quick fix worked once, but one break left me stranded on a mountain from 4am ’til 8am…good thing we had cell coverage! Lesson learned: you can’t have too many spare parts! Well, I wanted to make the truck more self-sufficient. I hate things to go wrong, especially out on the trail. And dual batteries also help for winching, so I talked to a few friends (credit goes to Vern O’Connor) and came out with a nice, cheap, simple way of hooking up two batteries. Here’s the details. They will come on/off together. They work together to handle the draw from the back-up battery. They are generally rated for 60 to 80 amps, and while winching it’s easy to draw more than that from a battery. In parallel, they can handle considerably more amperage. You can just use a heavy piece of copper on each side of the solenoid pack to tie the heavy amp terminals together. Here, I call one side of the solenoid packinput and the other output. 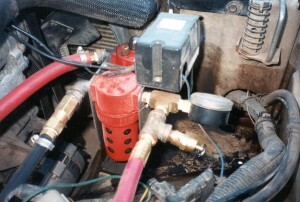 Hook the vehicle electrics (starter, what-have-you) to the output of the solenoid pack. Hook the positive of the primary battery to the output of the solenoid pack. Hook the positive of the secondary (back-up) battery to the input of the solenoid pack. Hook the output (center pin) of the SPDT switch to the solenoid pack switch terminals. Hook one throw of the SPDT switch to your ignitions switch. Hook the other throw of the SPDT switch directly to the secondary battery. Tie the two battery grounds together and to the chassis of the vehicle. Anywhere high amperage is being drawn, use good quality wire. I used 1-0 gauge wire. Remember, with two batteries, there is a potential for a lot more amperage to be drawn through the system by a winch or a start. Take standard precautions with electrical systems that are well documented almost everywhere, call the job done. I took the opportunity to relocate my main battery at the same time in preparation for the on-board air project. SInce my relocation doesn’t apply to XJ’s, I won’t mention it here. This was a fun project. And it has been a very practical project, too. Sure, I use the heavy duty axles and the long travel suspension every time I go off-road, but I’ve used the on-board air just about everywhere. I originally sourced a few York compressors since I didn’t want to deal with oilers and separators and because it has a higher flow rating than the stock compressors. Take my advice: on a XJ or MJ, it will take a _lot_ of work to fit a York under the hood. 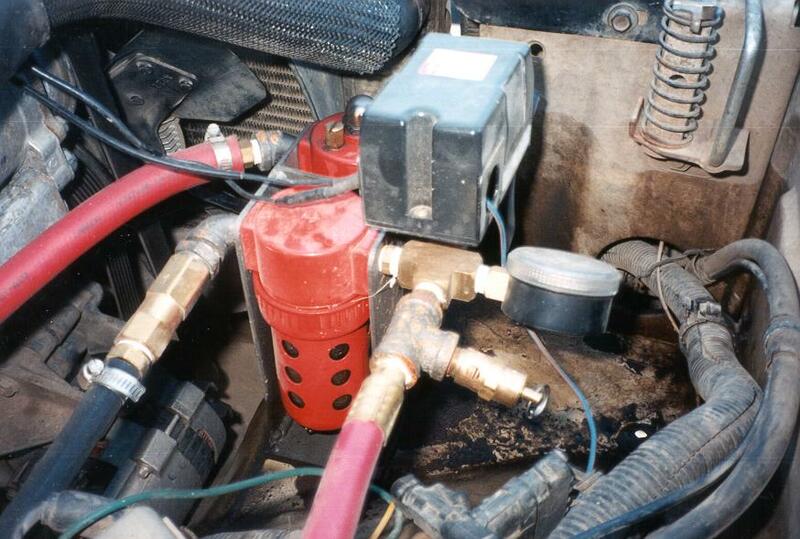 Yorks work under YJ hoods, but for an XJ or MJ, choose the factory compressor. It’s easier to install on the vehicle and you don’t have to worry about finding a serpentine pulley for a York (tough but possible). The oiler was intended to oil air tools. It works equally well for oiling air conditioning pumps. 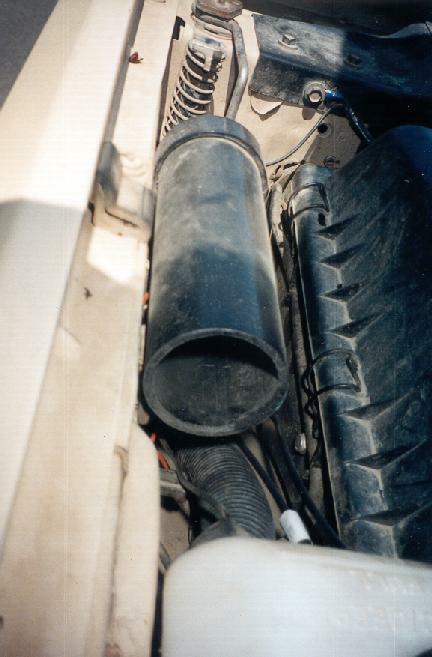 The filter is a simple crankcase ventilation filter intended for a Chevy 350 engine. Cheap and it works. The separator’s purpose is to remove any liquids (oil and water) from the line before reaching the tank. I should have mounted this further from the compressor, as the hot air from the compressor degrades the effectiveness of the separator. Someday, I may fix this, but it traps the majority of the liquids, so I’m happy. The regulator is used to automatically engage the compressor to keep the system at a happy pressure range. Mine is set to kick in at about 115psi and kick out at about 135psi. At these pressures, I can inflate tires faster than most gas station compressors! Great for running air tools too. The check valve is located between the compressor output and the separator. Its purpose is to prevent leakage from the tanks back through the compressor when the compressor isn’t working, and so that the compressor doesn’t have to start under load. The pop valve is a good safety device. It is preset at 175psi so that the system can’t rupture from too much pressure. A pop valve preset at 150psi would be a better choice, but none were in stock when I assembled my system. I’ve seen some systems without a regulator, that only use the pop valve to regulate pressure. This is not a good idea. Most pop valves are intended only as a safety device, and not designed for continuous use. It is also inefficient, since a pop valve will often not close until the pressure has dropped considerably. And its noisey. The pressure gauge is useful for monitoring the system. Since these pictures, the underhood assembly has been slightly relocated to make room for the larger welder alternator. The shocks have also been relocated since the picture showing the tanks was taken. It’s unnecessary to be driving around with the system under pressure. If you’re not using it, then leave the system off. It’s good from a safety perspective, and there’s just no need to keep the system under pressure all the time. You’re not building a highway tractor with air brakes. Do not use regular air line either off the compressor exhaust, or near anything hot, such as the exhaust. The air exiting the compressor is very hot. Normal air lines cannot withstand high temperatures under pressure. Neoprene air line is available, and can easily handle the heat from the compressor. It’s the black air line in the above pictures. I have lines routed by the exhaust to route air to/from the tanks. Here, I replaced the regular air lines with steel lines. Build decent storage capacity into your system. I have two tanks mounted under the truck bed, just above the exhaust. The location is nice and tidy, and I have about 5 gallons storage. This storage lets me run air tools. Take the time and run lines to both ends of the truck. You’re not always using the compressor on your truck; your buddy’s truck may be fore or aft of yours. Put a drain on each tank. They will collect moisture and should be drained on a semi-regular basis. There is no point in letting the tanks rust out. Use the system when you’re building a camp fire. You’ll be amazed how quicker the camp fire grows with a little compressed air! Don’t try adding diesel fuel to the air line to build the camp fire even quicker. Tried it, doesn’t work effectively. I haven’t got the nerve to add gas into the air line to build a camp fire. If someone does, please let me know what degree burns you receive. Now here is an easy project that is under $10! I stole this idea from some buddies with Jeep YJs. I was always worried about the engine sucking water if I get into something really deep. The factory air intake may be good in the sense that it pulls in cold air, but I really wanted it higher. And I didn’t want to pay an exorbinate amount of money for something outside the body that is waiting to get ripped off in our trees. The solution: some simple PVC pipe and a few elbows. A hole is cut into the bottom side of the air box, and the original intake is blocked off with a piece of flat plastic. The air intake has moved up some 5 inches and the water has to change direction in order to enter the air box. And it’s tidy. It won’t give me 100% protection, but in theory the ignition should die from being submerged in water before the engine can hydro itself. Loooooooong time, no communication of any kind! I don’t know if you still check this blog, hopefully you do. I’ve recently returned to the Jeep fold and am building up a ’95 XJ. It’ll mainly be for overlanding but my aim is to make it rock-crawl capable as well without giving up too much comfort and livability. Good to hear you’re returning to the Jeep fold! I heard of my old Jeep coming up for sale and debated chasing it, but never got good enough information on its where-abouts. 🙁 You’ll love the XJ, though, great vehicle! Junk yard axles seem like a great idea at first, but junk yard axles don’t offer a solution to the ABS and ESP satfey features that are required with the new Jeep models. Trust me, we tried with this JK and it was more cost effective to go with a Dyanatrac axle. Especially when you include the amount of time you spend trying to figure it all out. Well, this vehicle predates ABS and ESP so there was no need for that consideration. Being a university student at the time, I had more time than funds so the only way to do this was via a junkyard axle build-up. Plus, you cannot put a price on the experience and knowledge learned during this process. I would do it again (instead of buying pre-built axles) in a second.